‘Do not judge, or you too will be judged. 2 For in the same way as you judge others, you will be judged, and with the measure you use, it will be measured to you. 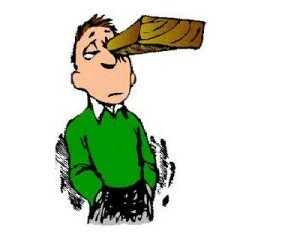 3 ‘Why do you look at the speck of sawdust in your brother’s eye and pay no attention to the plank in your own eye? 4 How can you say to your brother, “Let me take the speck out of your eye,” when all the time there is a plank in your own eye? 5 You hypocrite, first take the plank out of your own eye, and then you will see clearly to remove the speck from your brother’s eye. Image source: Seasons of Life Ministries. Earlier this week I went back to my day job, teaching History, after a glorious three week holiday. I usually find the summer term to be pleasant, but busy. A great deal of my time during this term will be spent preparing my pupils for the end of year exams that they will face in just a matter of weeks. Some of my pupils will have exams that are marked by external examiners. It is important, therefore, that their work is not just of a good standard, but is legible. I find it hard to criticise my pupil’s handwriting, however. You see my handwriting is pretty poor. That is to say that it is not messy, per se, but it is small and can be difficult to read. Quite often my pupils have to come and ask me to read the comments I have put on their work because they can’t read my writing. It would feel a little odd under these circumstances if the comment I had written, that they were unable to read, was ‘watch the legibility of your handwriting’! Really I need to address my own weaknesses in this area before I can make comment on their poor writing! Once again, in today’s passage from the Sermon on the Mount, we find Jesus warning against hypocrisy, this time in terms of judging other people. Straight away, he warns, ‘do not judge, or you too will be judged’. The prerogative of judgement is assigned to Jesus himself; he has been entrusted with the ultimate judgement of all people. He is, of course, in an ideal moral position to judge, since he himself lived a perfect life, free from any sin or wrongdoing. We, on the other hand, have not lived sin free lives. There are plenty of wrongdoings in all of our lives. The problem we encounter when we seek to judge others is that we are not blame-free ourselves. Often, when we judge others, what we are really doing is denigrating them purely to elevate our own position, to portray ourselves as holier than the person whom we are judging. Jesus issues a clear warning here. If we should seek to judge others,we will be judged in the same way. If we judge another person when we know that actually we are guilty of the same, or perhaps an even worse sin, then we are hypocrites and can expect to feel Christ’s anger when we face him at our own judgement. As Jesus puts it, we must first remove the log from our own eye before seeking to remove the sawdust from our brother’s eye. Of course, we are not forbidden from holding each other to account. Nor are we told that we should not seek to correct the failings of our brothers and sisters within the church. If we see behaviour that is inappropriate, or someone stumbling in some other way we are not simply to ignore it and to leave our neighbours to their failings. We should help them to ‘remove the speck’ from their eye. We are to do so having first ensured that we are in a position to do so, and that we do not have any logs of our own that first need to be addressed. We are to do so remembering that we are all brothers and sisters, having been united as God’s children through the death and resurrection of Christ. And we must ensure that our correction is intended to encourage our brother or sister, to spur them on, and not simply because we are judging in order to portray ourselves as better than they are. We must not stoop to the practice of belittling others simply to elevate our own position. Today, why not reflect on your own journey of faith. Are you aware of any stumblings in your own life, any planks that need to be removed from your own eye? Pray today that God will help you to see clearly any issues that you need to address in your walk with him. And remember, it is not forbidden to judge the behaviour of others. Any critique of others, though, must be handled in a loving manner, with the realisation that any judgement that we impose will also be applied to us.